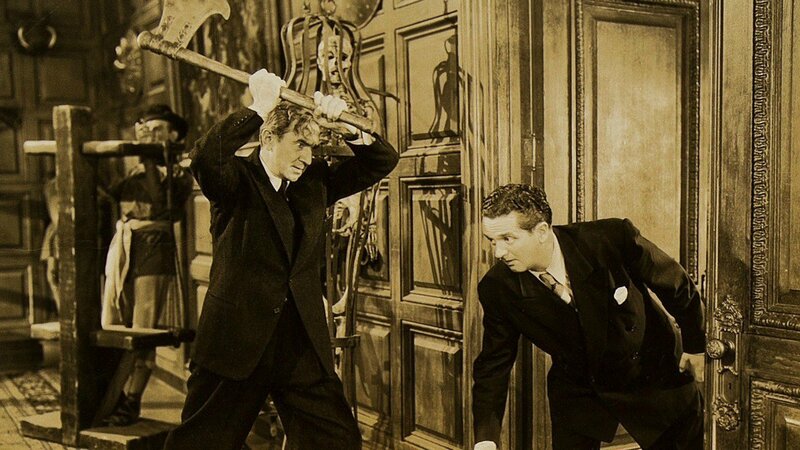 Back in 2015, I reviewed a turkey called ZOMBIES ON BROADWAY , which paired Bela Lugosi with the “comedy” team of Wally Brown and Alan Carney, RKO’s cut-rate answer to Abbott & Costello. 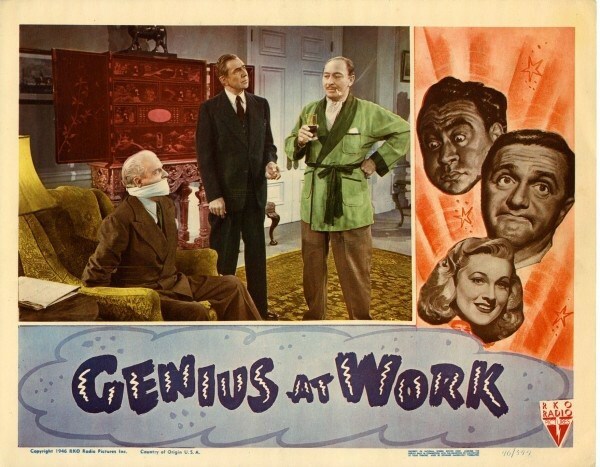 Well, it seems the studio threw together this unlucky trio again, along with co-star Anne Jeffreys and adding horror icon Lionel Atwill in another attempt at a scare comedy titled GENIUS AT WORK. Glutton for punishment that I am, I recorded it, then watched, expecting another bomb… and instead found a fairly funny little ‘B’ movie that, while not on a par with ABBOTT & COSTELLO MEET FRANKENSTEIN , is a whole lot better than the aforementioned ZOMBIES fiasco! You can throw logic out the window in the script by Monte Brice and Robert E. Kent, but you’ll find some amusing situations and good wisecracks courtesy of Brown and Carney. This was their last film as a team, and it seems they finally hit their groove, with Brown doing his comic double-talk routine and Carney his trademark dumb act. 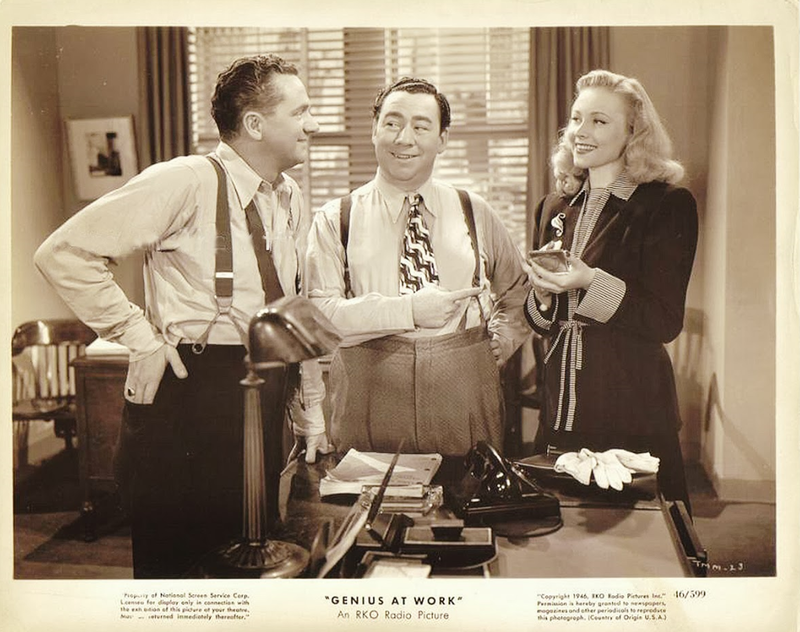 Anne Jeffreys livens up any ‘B’ she appears in; this was her fourth film with B&C, and her enthusiasm in the mixed-up proceedings helps carry the movie. 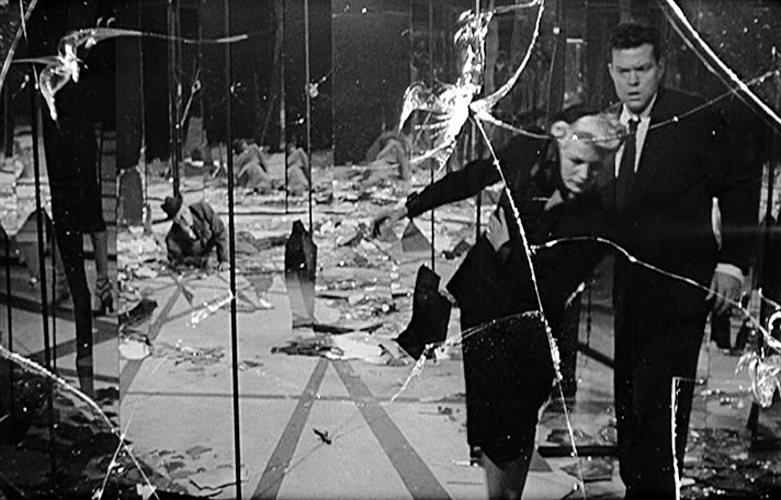 Marc Cramer’s dull leading man role is a drawback, but fortunately he’s not onscreen too often. As for Atwill and Lugosi, the veteran spooks elevate GENIUS AT WORK by their mere presence. Atwill is his usual sinister self as Marsh/The Cobra, with a demented gleam in his eye and a ‘hobby room’ that’s a collection of torture devices (which serve to provide some sight gags for Brown and Carney). Bela is equally sinister as the henchman Stone, and even gets a few laughs at his own expense, like when Carney drops a heavy blunderbuss on his foot! Towards the end, the horror stars disguise themselves as an elderly couple, with Atwill dressed in old lady drag (shaving off his pencil-thin moustache to boot!). Unfortunately, this was his last completed film; the star of early horror classics DR. X and MYSTERY OF THE WAX MUSEUM succumbed to cancer that year before finishing work on the serial LOST CITY OF THE JUNGLE. 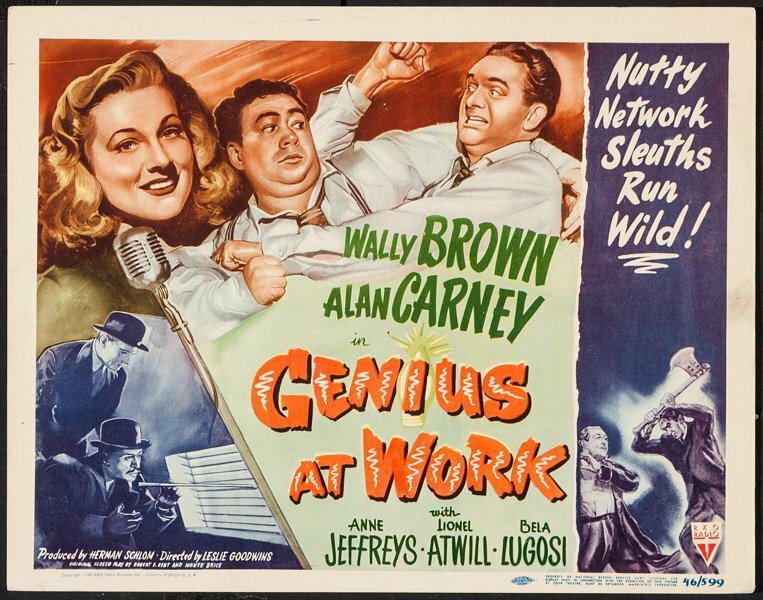 GENIUS AT WORK isn’t exactly high art, but it doesn’t deserve the bad rap it gets among critics. It’s probably the best of the Wally Brown/Alan Carney series (which admittedly isn’t saying much), Anne Jeffreys is always a welcome presence, and Lionel Atwill and Bela Lugosi (in the last of seven films they made together) help kick things up a few notches with their malevolent machinations. You can’t ask for much more out of a ‘B’ movie!